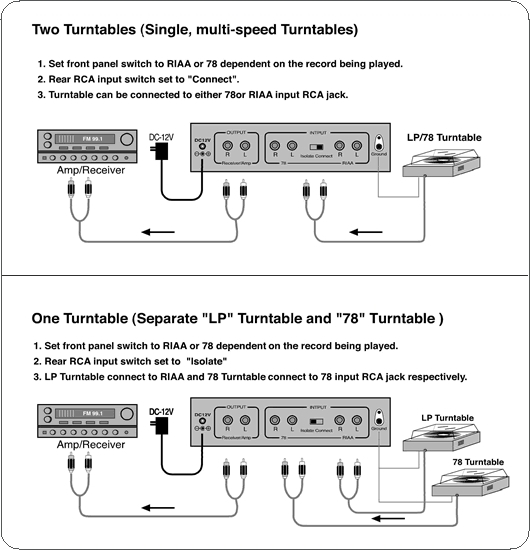 78 turntable to an existing audio amplifier, PC sound card, or CD recorder. equalization for either modern RIAA records or for early 78 RPM records. ․Accepts standard moving magnet cartridges. ․Accurate phono equalization for either modern RIAA records or old 78 RPM records. ․Can accommodate single turntables or separate 33 and 78 turntables. ․Gold plated input and output connectors for reliable performance. ․Stylish, solid metal case for improved resistance to electrical noise.